Millions of people took to the streets of Paris and cities across France on Sunday to rally in defense of free speech and against terrorism in the wake of Wednesday’s deadly attack on satirical newspaper Charlie Hebdo. The French Interior Ministry told the Associated Press that 3.7 million marched throughout France, making the demonstrations the largest in the country’s history. Adding to the symbolic weight of the demonstrations, more than 40 world leaders joined the start of the Paris march, linking arms in an act of solidarity. But as Reporters Without Borders points out, their policies at home are far from compatible with the solidarity for free speech on display throughout France. They’re right. 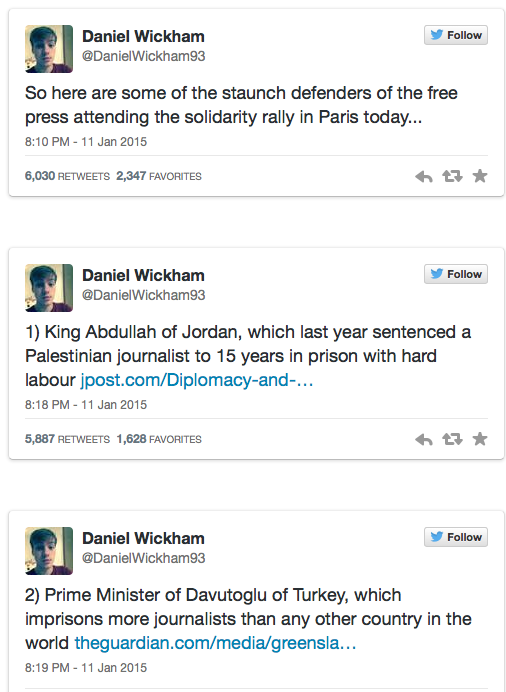 In what can only be described as an epic series of 21 pointed tweets, London School for Economics Middle East Society co-president Daniel Wickham points out that many of the world leaders who marched Sunday through the streets of Paris are not the world’s biggest advocates for press freedom. forget the rest of the tweets . Read through to the end in order to understand the extend of manipulation that general public is going through. We are pawns in the hands of our oppressors. The easiest way to find out the truth is to take everything that comes out of corporate mass media and the authorities and turn it on its head. nice tight shot. ala jesse jackson . I refuse to believe "millions" of people. Photo's prove nothing. They can be shopped as well. Sarcastic tone on. Irony lies where they are lying through their tongues while linking their arm forming Illuminati pyramid shape. Shame on them.